The 1981 Indy car season will always be remembered for the summer-long legal dispute between Bobby Unser and Mario Andretti over who won that year's Indy 500. Unser scored his third and last Indy 500 and enjoyed the Sunday afternoon victory accolades but when USAC posted the official results the following morning Andretti was listed as the winner. Unser had been moved down to second courtesy a one-lap penalty for passing a string of lapped cars under the yellow. "That year the car, the team, everything, went like it was an ideal year," Unser recalls. "It was similar to 1972 with Gurney. Not quite the same, but very similar. I had a car that was decidedly better than everybody else's car. I really was a smarter Bobby Unser in '81 than I was in '72, even though in '72 I drove the car easier than it could have been driven. "But in '81 I really did it the right way. We were the car to beat all day and even that long dispute about me passing cars under the yellow couldn't take that race away from me. We won it on raceday and then we won it a second time four months later." Roger Penske protested USAC's decision and he and Unser spent four and half months fighting the ruling. Eventually, Unser was allowed to keep his win and was fined $40,000 for his transgressions. "There was nothing wrong with what I did," Bobby growls. "That was totally an acceptable and legal thing. Exiting turn two is where the pit entrance ended and that's where I passed those cars. It didn't make any difference. We were going to win the race. The sad part about it was it brought a lot of bad attention to Indy car racing. It had its own life and kept on going for a long time, but it was better for Bobby Unser because I won the race twice." Of course, Andretti has a very different opinion. To this day Mario believes he won the '81 500 and showed his disgust by throwing his victory ring into the lake at his retreat in northern Pennsylvania. Meanwhile, Unser was unable to win another race in 1981 and Rick Mears ended-up running away with CART's 1981 championship with the help of poor seasons for both Unser and 1980 champion Johnny Rutherford who won the season-opener at Phoenix, but failed to win another race that year. Unser took three poles and four other front row starts but no more wins. Nor did Rutherford or Unser finish enough races with Rutherford failing to make the checker in half the races and Unser not finishing four races so they wound-up fifth and seventh in championship points. A pit fire during the race at Indianapolis left Mears with some burns to his nose and face, but thereafter he was a model of consistency in 1981. Mears took his second CART championship by a record margin from teammate Bill Alsup who enjoyed a string of solid top five and top ten finishes driving a third Penske entry in most races. Nobody else put together any kind of a championship run. Tom Sneva was the only driver other than Mears to win more than one race. Sneva won twice, but also failed to finish six races, while Mears won six times and finished every race other than Indianapolis. "When people say the first one is always the best, that wasn't true for me," Mears reflects. "For me, the second championship was better than the first because you start thinking you may never win this thing again. When you're fortunate enough to win it again, you're thinking, 'Man, I've got two. That's unbelievable!' Then of course, you start to think it may never happen again." An intriguing aspect of the 1981 season was the remarkable performances turned in by All American Racers' unique BLAT Eagle-Chevy. At Milwaukee, Mike Mosley came from the back of the field to score a superb win aboard AAR's Chevy-powered car, recording the only Indy car win by anything other than a Cosworth engine over a nine-year stretch between 1978 and 1986. The Boundary Layer Adhesion Technology (BLAT) Eagle-Chevy was first raced in 1980 and is Dan Gurney's favorite Eagle of all the many Eagles that were designed and built at AAR because it represents everything that defined Gurney and AAR. The car was completely different from conventional thinking, highly innovative in a number of ways, and--the ultimate compliment--it was so successful that it was banned! The maverick Eagle-Chevy package was entirely competitive with the turbo Cosworth-powered opposition in 1981. At Indianapolis Mike Mosley and the Eagle were quick from the start of practice and attracted plenty of attention from other teams. Mosley qualified second for the 500, sharing the front row with Bobby Unser's Penske-Cosworth and A.J. Foyt's Coyote-Cosworth. But Mosley was the race's first retirement after just sixteen laps with an oil leak. At Milwaukee the following week there was more bad luck when Mosley started last after missing qualifying because of an engine failure. As soon as the green flag waved however, Mosley began to motor to the front. Incredibly, he passed everyone and went on to win as he pleased by over a lap from Kevin Cogan and Mario Andretti. Gurney was even more impressed when Mosley led the Michigan 500 two months later before missing a shift on a restart and blowing his engine. While Mosley drove the Eagle in the oval races, Gurney put Rocky Moran and Geoff Brabham in the car for the road races. Moran led at Watkins Glen before a refueling problem and Brabham qualified on the pole at Riverside and also was on the outside of the front row in Mexico City. At Riverside, Brabham ran away from the field until his first pitstop when the left rear wheel nut was cross-threaded, leaving him stranded. 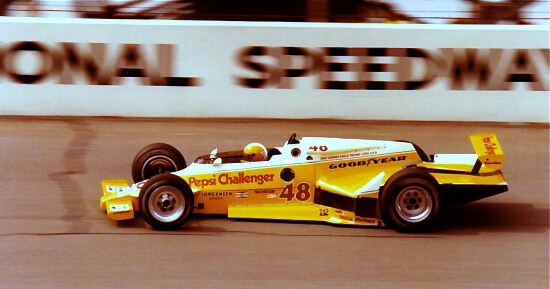 The Eagle's success prompted other top teams like Penske and Truesports to build experimental Chevy-powered cars in 1982. Suggestions were made that it would become necessary to have turbo engines for ovals and stock-blocks for road courses, therefore pushing up costs. Eventually, CART solved what they perceived as a problem by writing first the BLAT aero concept and then stock-block engines out of the rulebook. Meanwhile, Bobby Unser quit Penske at the end of 1981 and took up briefly with Pat Patrick's team before deciding to retire before the start of the 1982 season. Bobby was 47 at the time and had enjoyed a long, productive career including three Indy 500 wins and two championships. He was without doubt one of the toughest, most aggressive drivers not only of his era but all-time. Penske hired promising Formula Atlantic graduate Kevin Cogan to replace Unser after Cogan turned in some good performances in 1981 driving Jerry O'Connell's Indy car. Penske's designer Geoff Ferris produced a beautiful new car for 1982. The PC10 looked good in testing and Mears dominated the year's first two races. He won from the pole at Phoenix and performed the same feat at Atlanta, his favorite track, where he won for the fifth time in five years. At Indianapolis, Mears took the pole by no less than two and a half seconds from new teammate Cogan, setting a new track record at 207.004 mph. 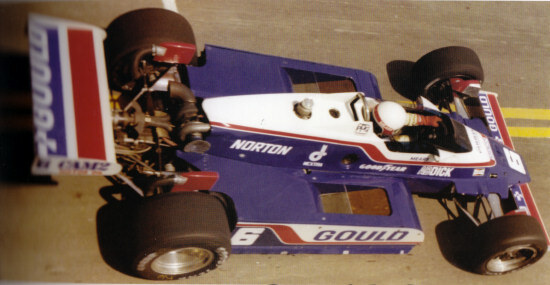 Foyt qualified his March 82C third with Mario Andretti and Gordon Johncock qualifying on the second row in their pair of Patrick Racing Wildcat mk 8Bs. The start at Indy that year was one of the more infamous in history as Cogan was caught-out when the turbo boost came on as the field took the green flag. Cogan got sideways, clipped Foyt's car, and then spun into Andretti's path. Cogan and Andretti were out on the spot and Mario was as unhappy as he's ever been at Indianapolis, believing he had the car to challenge Mears in the race. Back in the garage, Andretti had some very uncharitable words to say about Cogan, grumbling about, "sending a child to do a man's job." About an hour later the race finally got going without Andretti and Cogan. Foyt took the lead for a while but Mears soon passed him with Johncock and Tom Sneva in another of the new March 82Cs also passing the veteran Texan. Foyt dropped out after a pit fire and a transmission failure while Mears and Johncock did most of the leading with Sneva not far behind. But Sneva had trouble of his own on his last pitstop when his refueling system wouldn't deliver any fuel for half a minute. In the end, the race was decided by the final pitstops as Mears was balked by a slower car, then took on too much fuel, while Johncock enjoyed a rapid, troublefree stop. Johncock made his final stop three laps later and came out of the pits with a twelve second lead over Mears. Ten laps to go and Mears had cut Johncock's lead to 9.5 seconds. Five to go and the margin was less than four seconds. Mears finally caught Johncock as they began the race's 200th and last lap. "I got to him and I had a run on him," Mears recalls. "I said, 'Why wait?' I had passed him earlier in the race and I thought, 'Good, we've got him!' But when I went beside him he showed me some straight line speed I hadn't seen all day. Whether that was because I was heavier on fuel, or they had been saving a little boost, but he had some momentum on me going into the corner. I thought, I can let him go, because it was his corner and there are three more corners and another opportunity. Or I could stay here until we crashed. But I didn't want to do that." Mears had to back off and give the piece of road he wanted to Johncock but his momentum was lost and he couldn't get close enough to take another run at Johncock. Many people who were there that day remember it as the only race they've attended where the shrill cry from the turbocharged engines was drowned by the roar of the crowd. "Even though we ran second, I had fun," Mears says. "I was happy with the performance. I felt we had done all we could do. I've never believed the theory, 'Show me a good loser and I'll show you a loser.' I've never believed in that. I felt like we had done everything we could. Sure, you'd be happier if you won, but as long as you feel in your heart that you gave it your best, why be unhappy about it?" He may not have won the Indy 500, but Mears clearly was the man to beat over the rest of the season. Mears and Cogan scored a triumphant, one-two for Penske in the Pocono 500 and Mears also won a 500K road race at Riverside. Mears's record from a dominant year included four wins, nine poles and 823 laps led from a total of 1,777 laps, so he led forty-eight percent of the season. Teammate Cogan led 106 laps during the year so Penske's two drivers combined to lead 929 laps. Yet Mears believes if he had a few more years experience under his belt, they could have done even better. "We should have won more races than we did with the PC10, but I was still learning," he says. "We probably would have won a lot more races and been a lot more competitive if I had the PC10 another five or six years down the road with the same advantage that car had over the others. At times, we got the most out of it, but other times we didn't because of my lack of experience." There was plenty of competition that year from Andretti and Johncock with Pat Patrick's Wildcats and also from Tom Sneva, who was driving for George Bignotti's Bignotti-Cotter team, and rookie Bobby Rahal who had joined the CART series that year with Jim Trueman's Truesports team. Andretti had essentially retired from Formula 1 at the end of 1981 and he ran the entire CART season for Patrick in 1982. Andretti finished second four times but failed to win any races while teammate Johncock had a great year, winning both the Indy and Michigan 500s. At Michigan, Johncock and Andretti scored a one-two sweep for Patrick. That year's Wildcat chassis were built in Indianapolis by Jackie Howerton and the cars were put together at Patrick's shop just a mile or so north of the Speedway. Although few people guessed it at the time Johncock's Wildcat would turn out to be the last Indy 500 winner built in America. "We built our own tubs in 1982," Jim McGee recalls. "Jackie Howerton had worked for Pat for many years as a fabricator and we had him build us some new tubs. The '82 car was an upgraded version of John Thompson's Phoenix from the year before and it was the last American-built car to win the Indy 500." The revelation of the 1982 season was Bobby Rahal with Jim Trueman's fledgling Truesports team who beat Andretti to second in the championship. Rahal had shown his ability in Formula Atlantic, Formula 2 and Can-Am cars and he scored his first CART win as a rookie at Cleveland in July and also won at Michigan in September, thus proving himself an ovalmeister as well as a first-class road racer. 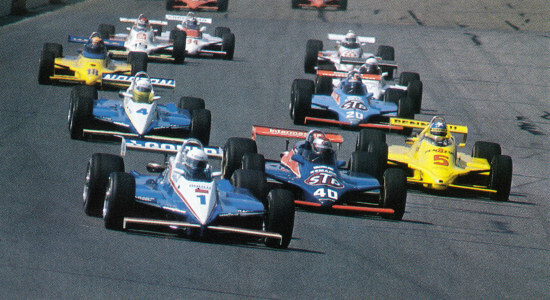 Rahal and Tom Sneva were among those who raced Marches in 1982 as the English car builder began to establish itself as a competitive Indy car constructor. Sneva joined George Bignotti's Bignotti-Cotter operation in 1981 and over the next three years he and Bignotti were an increasingly strong combination as they developed the March chassis into a reliable, race-winning car. 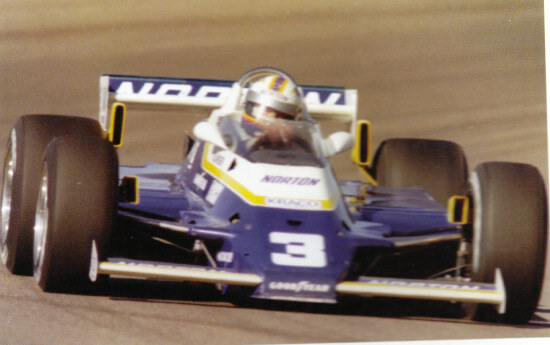 Sneva won at Milwaukee and Phoenix in 1981 and won both races again in 1982 before scoring a convincing Indy 500 win in 1983 for Bignotti-Cotter and March. Meanwhile, the Chaparral 2K was showing its age as the car was outpaced by the newer, more refined ground effect designs from Penske and March. Rutherford won the 1981 season-opener at Phoenix but that was the last race he was able to win with the Chaparral. By the end of 1982 the car was out-dated and Jim Hall decided to pull out of racing although he would return some years later from 1991-1996 with sponsor Pennzoil. "As always in motor racing progress and technical development moves on," Rutherford remarks. "By 1981 and particularly '82 we had used up all the advantages the Chaparral had. Penske and the other top teams were developing their ground effects cars and in 1982 they were able to move ahead of us. The Chaparral was a great race car but now there were several newer, better Chaparrals out there from Penske and March. "And that's the way racing is. There was nothing out there that Jim wanted to buy that would be competitive and he didn't want to run what everybody else had. 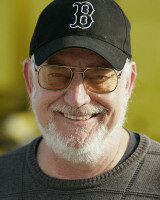 Through all his racing career he had always done his own thing and he decided it was time to take a break from racing." Next week, Al Unser scores a stealth-like win in CART's 1983 championship.